The Third Edition of Arkham Horror has had massive changes compared to its predecessor, almost a complete overhaul. Although it shares some mechanics with its fellows, it also brings a whole lot to the table (sorry, I had to say it) that is completely new to the Arkham Horror Files series of games. I suspect that when Eldritch Horror inevitably gets its own Second Edition that some of these will be carried over, although the world scale of that game means that some elements will not translate as well as they have here. Perhaps the most obvious change is that there is no conventional board. 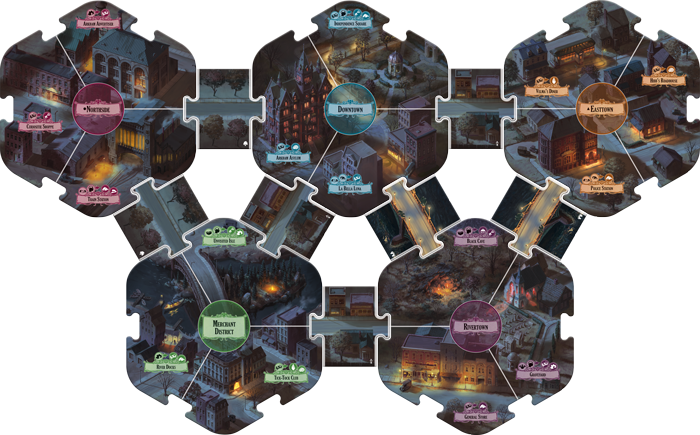 Instead, the playing area is made of a number of large pentagonal tiles (each representing a different area of Arkham) interconnected by streets. The five included tiles are all double sided but that doesn't mean that you get ten different districts as some are repeated to allow you to construct any configuration. This innovation allows for a much more diverse and varied layout than the static board of previous editions. The rest of the setup process is a little laborious with sorting of various decks and the removal of cards not featuring in the particular scenario of the four that you have chosen but, after a few games, it becomes easier and when you are finished the overall table looks a lot less cluttered than Eldritch Horror, with considerably fewer decks. 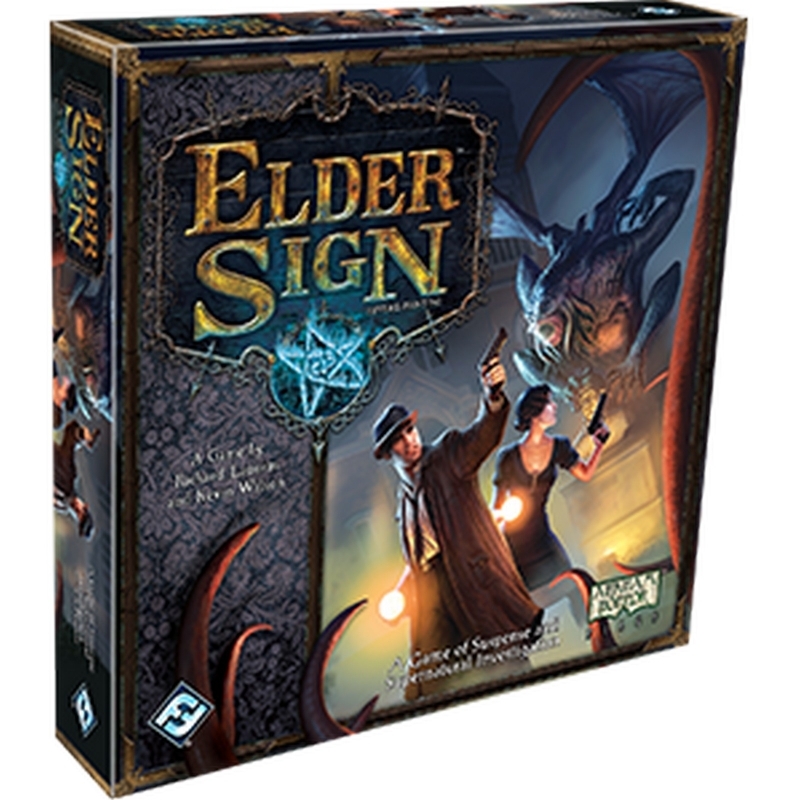 Like Eldritch Horror there are no miniatures in the box, allowing for a lower price point than most figure heavy games, but all the components within (both card and tile) are of the usual Fantasy Flight Games quality. This sweeping statement does not include the insert, which is to say that it is largely useless and will likely be discarded as soon as the first expansion is released so that I can accommodate everything within the box. The card decks are fairly familiar to players of any of the previous games, as are the standee characters. So far, so Arkham Horror Files! However, in Arkham Horror the monster decks are represented as cards as well, double sided so as to better represent the ready and exhausted sides, or as you will come to know them; the deadly and safe sides (you can evade an enemy to exhaust it as one of your two actions). There is a large variety of monster as well, ranging from the human cultist types to the myriad horrific creatures of the Cthulhu mythos. Certainly, there are no complaints regarding the number of different enemies that you will have to face, nor their potency in battle, the incautious Investigator will swiftly be overcome. Nor is there any issue with the selection of investigators themselves, with ten being included in the core set. 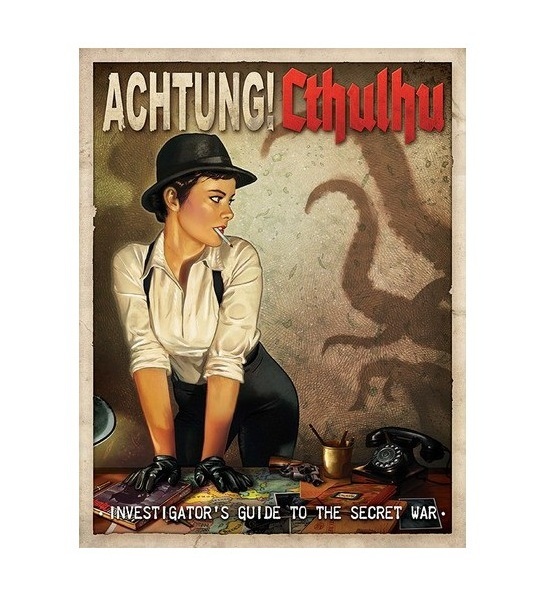 Although the amount of background provided on the different protagonists is similar to that provided in other Arkham Horror Files games, much more emphasis is bestowed here upon the roles that they perform in the game, with a greater focus upon teamwork and the way in which the investigator will contribute to the task at hand. Investigators can also take a varied loadout or an increased amount of items for a cost. Calvin Wright, for example, can elect to take an additional talent at the cost of a Dark Pact, anyone that has played Eldritch Horror will know what a double-edged sword that could prove to be! The Focus mechanic, introduced in Eldritch Horror’s Strange Remnants Expansion, has been tweaked here, now allowing you to increase a chosen skill by one (something which Mansions of Madness introduced in its expansions). This is very useful for improving a particularly weak skill or perhaps reinforcing a very strong one. Furthermore, the focus token can be discarded to re-roll a dice should you so need. Each character has a focus limit which prevents the mechanic from being abused but it is very handy to be able to buff a skill in advance of taking a test. The actual turn structure has undergone some revision as well, as has the narrative structure of the scenarios. The story is told through the means of a Codex, effectively a set of cards which you will proceed through pending on your successes or failures. This mechanic allows for a really strong narrative where you feel like Arkham is a real living place. One of the problems with Eldritch Horror was that you could experience a certain amount of dissociation from the game, feeling rather like you were just moving around picking up tokens and rolling dice, Arkham Horror does a great job of bringing you into the game as the story unfolds. It also plays a little quicker than Eldritch Horror as well, although you should still set aside a couple of hours for a game (as with any Arkham Horror Files game). The Mythos Phase now works with a mechanic taken directly from the Arkham Horror Card Game as each investigator draws two random tokens and this adds a real sense of trepidation and dread as you wait to see which tokens you have drawn and how they are going to affect you. A particularly bad draw can completely change the game and put the Investigators on the back-foot. Overall Arkham Horror Third Edition comes highly recommended. 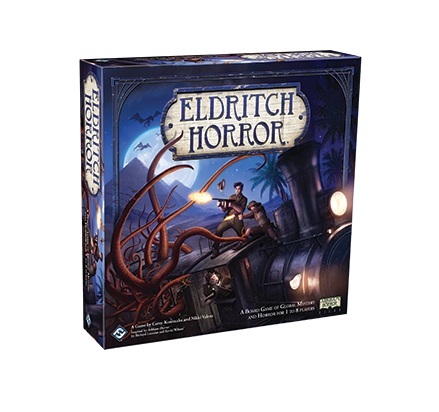 Easier to get to the table than Eldritch Horror, its clever construction should mean that even when FFG releases the inevitable deluge of expansions (the Second Edition had about eight in the end) it should still be manageable with extra tiles being added rather than whole boards. This, combined with the tighter, more involved narrative and the streamlined mechanics, puts it far above its predecessor and a worthy new edition. It's a different beast from Eldritch Horror even though it shares (and improves) some of those mechanics but it’s also the most accessible of two by far. More importantly? Get your own copy and play it for yourself!